collared kingfisher | BES Drongos | Follow that monkey! 50 creatures in CCNR for SG50! 50 amazing wildlife found in the Central Catchment Nature Reserve. Spot the odd one out! All adorable pixel animals by our resident artist Jacqueline Chua; Collage design by Adeline Koh. CCNR is known as the green lung of Singapore, occupying up to 2800 hectares of lush greenery – housing a magnificent diversity of flora and fauna right at the heart of the city-state. A mixture of young and mature secondary forests, as well as retaining a small patch of virgin primary forest near MacRitchie Reservoir, CCNR is home to fascinating creatures such as the Crimson Sunbird, the slow loris, the Sunda pangolin and even the critically endangered Raffles’ banded langur. Can you imagine a better way to celebrate national day than spending it in CCNR, walking through the verdant forests and observing dazzling flora and fauna? I can’t. Keep your eyes peeled for the next 50 days as we bring you more interesting facts and figures on each of the fifty species – right on our Facebook page! Also, stay tuned for more updates on the next guiding season – we are currently gearing up for public walks soon, with new stations and more entertaining stories from our guides! We managed to snag a walk with super-experienced guides Tony and Subaraj and it was awesome! They were incredibly knowledgeable and we learnt an incredible amount from them. They gave us so much interesting information that we can’t possibly cover it one post. 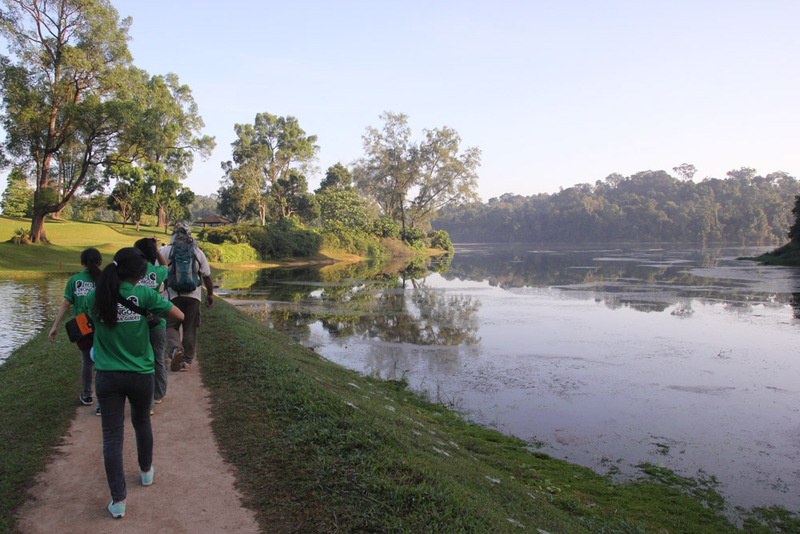 So, here’s the first part of the three part series of our guided walk at the Central Catchment Nature Reserve (CCNR). 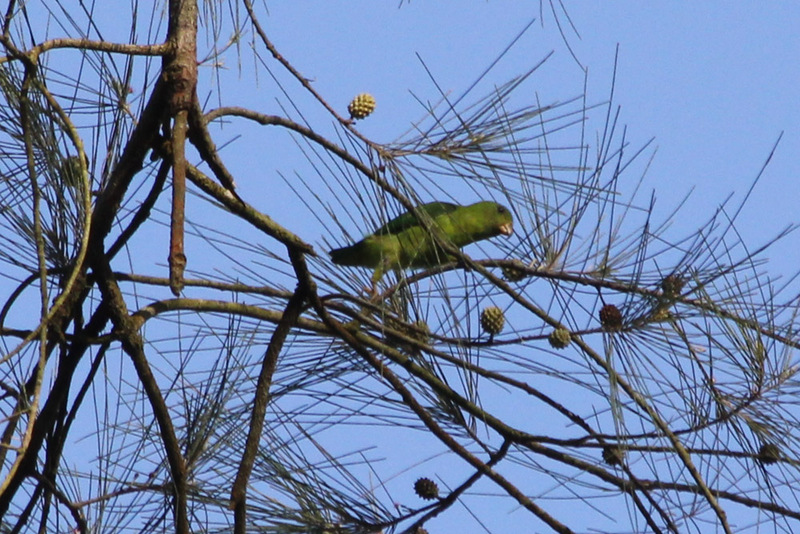 This colourful Blue-crowned Hanging parrot (Loriculus galgulus) was spotted perching high up on this Casuarina tree (Casuarina equisetifolia). As you can guess from its name, this adorable bird, like bats, can be seen hanging upside down. In fact, they are one of the three native parrots that can be found in Singapore. These fascinating birds usually roost high up in trees and can be tricky to spot. One way to identify it is by observing its flight. Parrots, like finches, have an undulating flight pattern: fly and drop, fly and drop. They almost seem to fly in a vertical zig-zag pattern. Weird right? Guess who else we found on the same tree? The Common Iora (Aegithina tiphia). Despite its bright yellow plumage and widespread population across our island, people usually do not spot this bird as it hunts high up in the canopy. Though you might not think so, we actually do share quite a few characteristics with these birds. Like humans, they are one of the few species (less than 10% in the animal kingdom) that are monogamous, meaning that they only have a one partner. 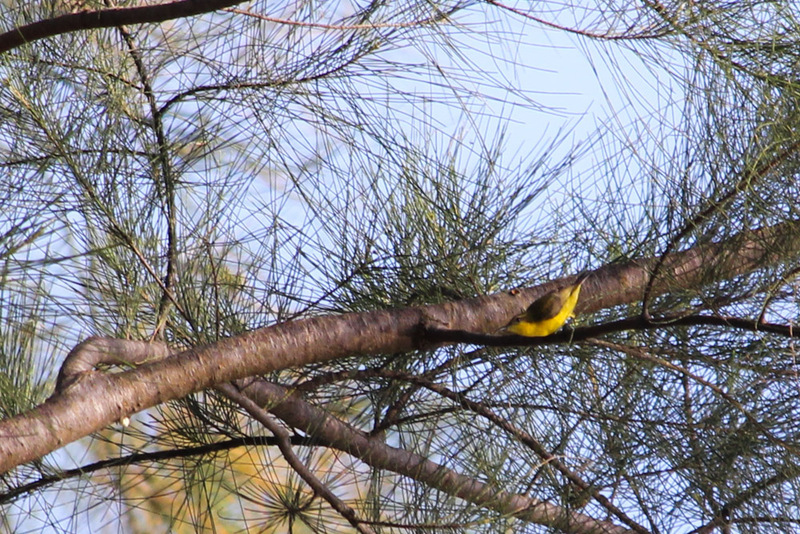 While humans have our Grand Romantic Gestures, the Common Iora have elaborate courtship displays. Though we might never know (unless one day a universal translator is invented) if these birds feel and love as we do, they still “date” and “marry”. We might have more in common with these birds than we think. 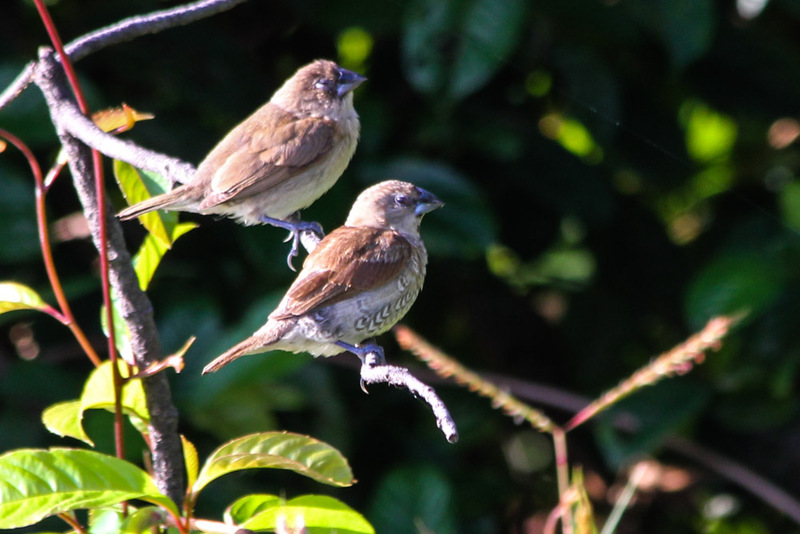 This pair of Scaly-breasted Munia (Ionchura punctulata) was found resting on a branch. The one in the foreground is the male, bearing his namesake “scaly” breast. Their beaks might look unusually large and conical-shaped, as compared to the pointed bills of mynas. Like Darwin’s famous finches, their beaks have evolved to feed from a certain niche of food. Their short and powerful beaks are shaped to pluck and crush grass seeds and small grains. Because of their particular diet, farmers who own paddy fields and other grain crops consider them as pests. This is just one example of the many wildlife conflicts that exist in the spaces when humans and wildlife coexist. 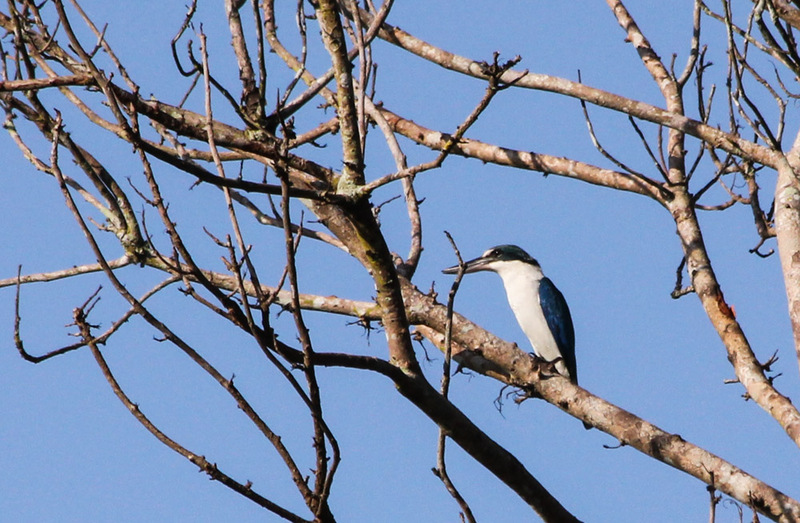 We also saw a Collared kingfisher (Halcyon chloris), roosting on a tree, which was easily recognized by its distinctive turquoise head and back with a black streak bordering its white collar – which makes it look like it is wearing a bright blue jacket! They are one of the few birds that have successfully adapted to an urban environment and have done so in two main ways: their diet and their breeding sites. These are perhaps the main reasons why they are the most common genus of kingfishers found in Singapore. Firstly, they don’t just feed on fish. They feed on a wide range of organisms ranging from lizards to prawns to earthworms. This has allowed them to survive beyond water sources. Fun fact: the name kingfisher is somewhat a misnomer as majority of the kingfisher species don’t even feed on fish. Instead, they feed on small invertebrates. Not exactly what you thought a “typical” kingfisher is like, is it? Secondly, they have adapted to nesting in rather unconventional ways. They have been spotted building their nest in a Styrofoam box or in nest holes along the walls of our ‘long kang’ (the colloquial term for canals). 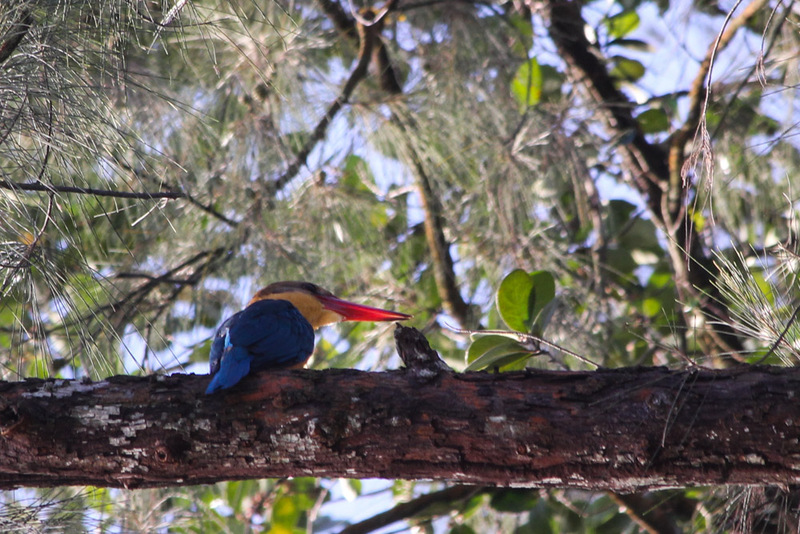 Other than the Collared Kingfisher, we also managed to spot this Stork-billed Kingfisher (Halcyon capensis)! Despite being the largest Kingfisher in Singapore and brightly coloured, they are less commonly sighted than the Collared Kingfisher. These colorful birds, with their large coral-red bill, orange-yellow under parts and bright blue wings, are more shy and less noisy than other kingfishers, making them more difficult to spot. There is something to be said about being quiet and stoic. 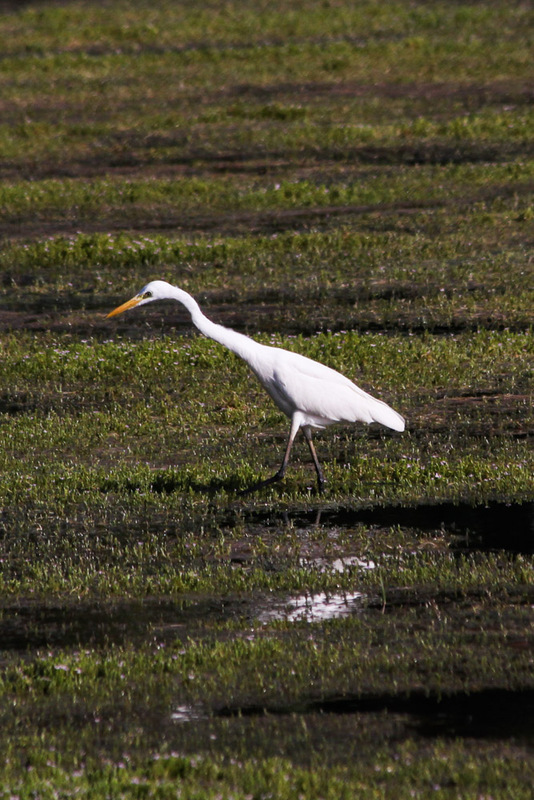 Speaking of Storks and other large shorebirds, this white medium-sized wader was seen stalking along the water bank. It is the Intermediate Egret (Mesophoyx/Egretta intermedia)! They are less common than the Little or Great Egrets (as you can tell, Zoologists are really creative people). As you can probably tell from the name, the Intermediate Egret is smaller than the Great Egret and bigger than the Little Egret. Fun fact 2: Egrets are actually just white herons. Both Herons and Egrets come from the same Family Ardeidae. The word Egret comes form the French word “aigrette”, meaning silver heron, referring to the lacy breeding plumes of white herons. The distinction between Egrets and Herons seem to depend more on appearance than any morphological differences and this differentiation arose due to the huge market for white feathers in the past. Why? Find out more about plume hunting. Another heron spotted with its neck stretched high was the Purple Heron (Ardea purpurea). It is one of our more colorful herons with its purplish-brown plumage (again, zoologist and their penchant for creative names). Though it might not seem so, its plumage acts as a great camouflage and keeps its well-hidden among the reeds. Though it is a common resident bird (meaning that it resides in Singapore throughout the year), like the Stork-billed Kingfisher, it is a shy one. They are crepuscular, which means that they enjoy hunting along the riverbanks at dawn and dusk. Unfortunately, they seldom perch, making it difficult for them to be spotted. So the next time you go for a walk at dawn or dusk, keep an eye out for these shy birds! 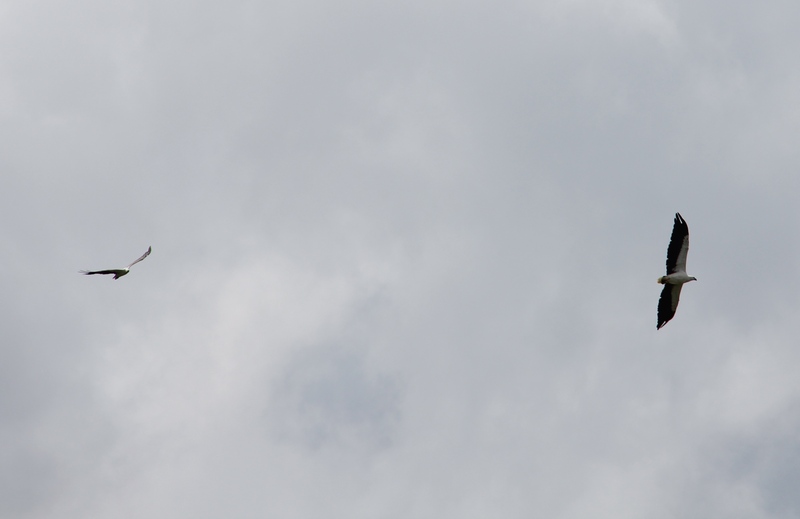 This pair of White-bellied Sea Eagle (Haliaeetus leucogaster) was seen, wings spread riding thermals high up in the sky. It is the largest raptor found in Singapore and like the Common Iora, appear to be monogamous. Once mated, they remain with the same partner for life and are often seen in pairs, just like the picture above. These cool birds have an odd call that sounds like a loud goose-like honking. The Brahminy Kite (Haliatur indus), another common bird of prey found in Singapore also has a strange call, described like a baby crying. Not exactly the spine-chilling shriek that you would expect from such fearsome raptors. Now you know that Singapore, a veritable concrete jungle, is populated by birds other than mynas, pigeons, sparrows and crows. However, many of these birds are dependent, to different extents and in a variety of ways, on our Nature Reserves. This highlights the importance of preserving what’s left of our nature reserves as they serve as vital “strongholds” (Game of Thrones reference anyone?) for these beautiful birds. If you want to learn more about our natural heritage, do sign up for our guided walks and we hope to see you soon!